Hot Dish or Casserole? What are they called in your house? I have lived in several different area's of the midwest, and had to learn to change with the region on what the dish is that I am baking. In Iowa, it was always "Casserole". After moving to Minnesota, I had to switch to talking about baking a "Hot Dish". Here in Wisconsin, both terms are used. Some people believe that it has to do with the region and what the religion of the area is, meaning Catholic or other. When getting ready to post this recipe, I did a little research on this topic. On Wikipedia, their research found that a "Hotdish" is a variety of baked casserole, that in the end is mixed with a "canned soup". What do you called your baked dishes?? Now that I have all that out of the way... (I got on a little research tangent there just because I typed "Casserole" in the title of the post)... I have been so busy lately, and not feeling the greatest, so I have been counting on some of my quick and easy recipes. Some times you just don't have the energy to be in the kitchen. This recipe is like that for me. Brown the meat while the rice is cooking, throw it together, bake, done. You are ready for dinner! Preheat oven to 350. Prepare rice. Brown meat, drain. Prepare seasoning, following directions on packet. Add meat and vegetables to seasoning mixture. Bring to boil, and cook for 10 minutes. In small roasting pan, layer as follows: Meat Mixture, 3/4 bag of noodles, rice, and cashews. Cover with foil, and bake for 45 minutes. Remove from oven and mix ingredients thoroughly. Serve with soy sauce, and reserved Chow Mein noodles. It DOES sound really good. 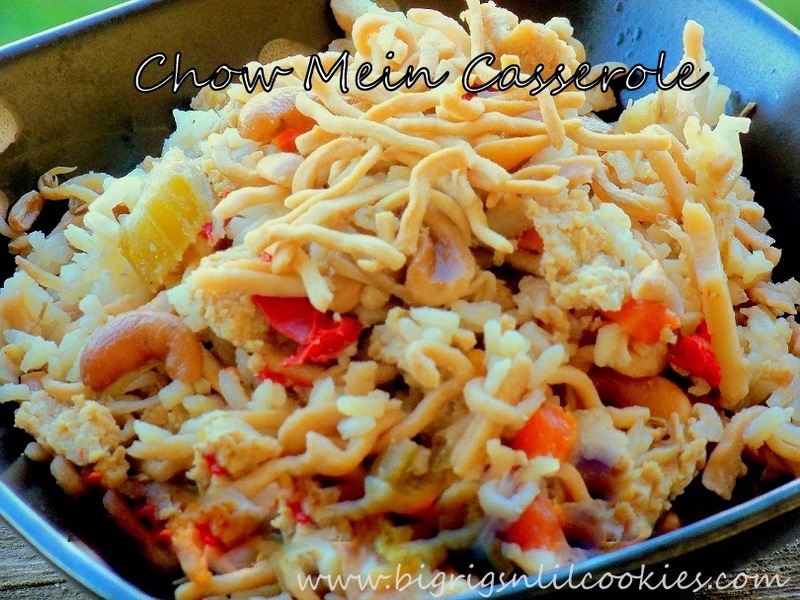 My mama use to make chow mein for family dinners in her pressure cooker. I love the addition of cashews to this. Thanks so much for sharing this lovely 'casserole' ;-) with us at Weekend Potluck.